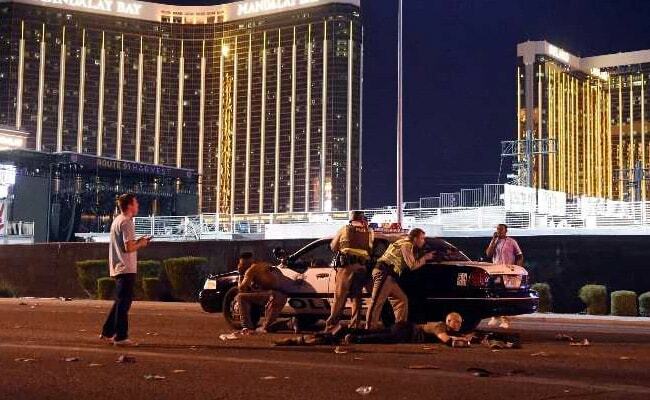 Las Vegas: Las Vegas police faced new questions on Tuesday over their response to last week's deadly mass shooting, after releasing a revised chronology in which the gunman shot a security officer before, not after, opening fire from his high-rise hotel window. The updated timeline for the bloodiest case of gun violence in recent US history raised new uncertainty over why Stephen Paddock ceased firing on concertgoers once he began, and whether hotel security and police coordinated as well as first believed. That sequence of events was changed in Monday's new timeline issued by Lombardo. "What we have learned is (the security guard) was encountered by the suspect prior to his shooting to the outside world," Lombardo said. In an active shooter situation, response time can be as fast as three minutes, said Sid Heal, a retired Los Angeles Sheriff's Department commander and tactical expert. "Someone needs to account for those minutes," he added. Campos immediately alerted the hotel's in-house security team after he was shot at 9:59 p.m., six minutes before Paddock first opened fire on the concert, according to Lombardo. Rather than storm Paddock's suite immediately, police paused to assemble their SWAT team and burst into his room to find him dead 81 minutes after the shooting began, according to the original account. "One of the biggest priorities is not to lose the life of a police officer," Shepherd said by telephone. "So in those six minutes, it is highly unlikely police would have stormed that room." "We cannot be certain about the most recent timeline that has been communicated publicly, and we believe what is currently being expressed may not be accurate," the company said in a statement late on Tuesday.